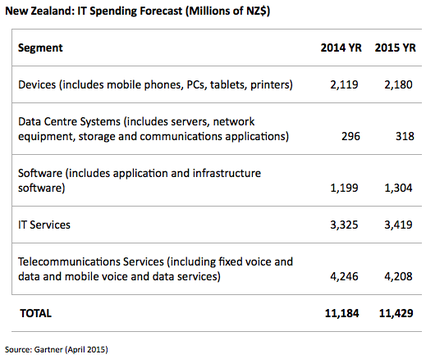 Including both enterprise and consumer technology spending, according to research analyst firm Gartner the Kiwi ICT industry will spend most of its money this year on telecommunications services, including fixed voice and data, as well as mobile voice and data services. 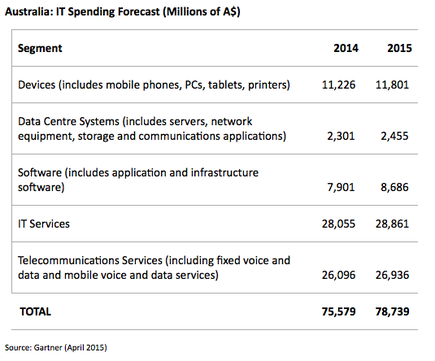 Measuring IT spending forecast in millions, during 2015 Gartner expects Kiwi organisations to invest around $4.2 billion around telco services, closely followed by a $3.4 billion commitment to IT services across the country. Businesses are also splashing the cash on devices, including mobile phones, PCs, tablets and printers, with companies expected to fork out as much as $2.1 billion on products this year, while software spend, including application and infrastructure and software coming it at around $1.3 billion. Further down the line, data centre systems, including servers, networks, equipment, storage and communications applications will hit the $318 million mark, up slightly from 2014 spend of $296 million. Across the ditch in Australia, spending on technology products and services is forecast to grow to A$78.7 billion in 2015, an increase of 4.2 percent from last year. With a strong focus around IT and Telecommunications Services like New Zealand, Australian organisations have also increased spending on devices and software spend, followed lastly by data centre investment as both markets provide similar trends. Globally speaking however, worldwide IT spending is set to shrink to US$3.66 trillion in 2015, a 1.3 percent decrease from 2014, with Gartner citing the rising dollar as chiefly responsible for the slowdown. "We forecast U.S.-dollar-valued worldwide IT spending in 2015 to shrink by 1.3 percent, down from 2.4 percent growth forecast in last quarter's update," says John-David Lovelock, research vice president, Gartner. “However, this is not a crash, even if it looks like one. The recent rapid rise in the value of the U.S. dollar against most currencies has put a currency shock into the global IT market. “Taking out the impact of exchange rate movements, the corresponding constant-currency growth figure is 3.1 percent, only off 0.6 percent from last quarter's update. "Such are the illusions that large swings in the value of the dollar versus other currencies can create.